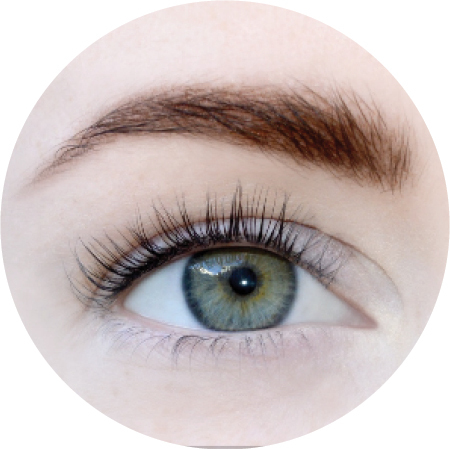 This technique uses 2 – 6 of the thinnest and finest extensions on each natural lash to create sets of 200 – 500 lashes per eye. A fan of extensions is applied to one single natural eyelash at a time. Every natural lash on the eye is different in terms of length, thickness and angle. Our experienced beautician creates a custom fan for every lash. 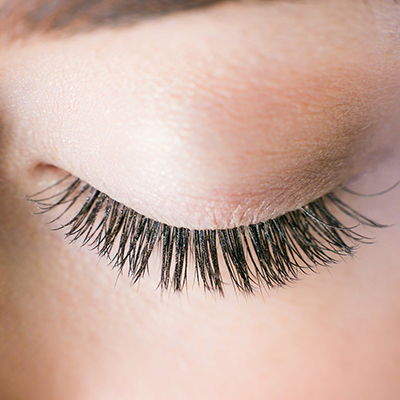 When two eyelash extensions are applied to one shorter and weaker natural lash it is called 2D. Furthermore, when 6 eyelash extensions are applied to one strong and long natural eyelash it is called 6D. A full set takes nearly 2.5 hours during which you will be laying down with your eyes closed. As the technique requires a significant amount of skill and experience, your practicing Cils de Marie beautician is on an advanced level. In order to maintain the full look at all times, the lash extensions need refills nearly every 4 weeks. Outgrown fans are removed while new fresh ones are added on mature natural lashes. This procedure takes about 1.5 hours. Your natural lash base defines the quantity of extensions recommended. It can vary between 90 and 140 per eye. Your own lash will hold on to the extension until the maturity of its life cycle and then will both proceed to fall out, making space for new ones. Your beautician will recommend a length, thickness and curvature as well as the type of material depending on your natural lash base and your expectations. The lengths vary from 8 to 14 mm and the thicknesses from 0.15 to 0.2mm. In terms of material, we use only natural looking and soft Premium quality mink ‘effect’ lashes. Taking into consideration your preferences, the technician will create a one-of-a-kind mix to best suit your desired optimal look. The technique is suitable for the most sensitive eyes. Many of our clients have even experienced intolerance of mascaras. A full set lasts nearly 1.5 hours during which you will be laying down with your eyes closed. You can relax or take a nap during the gentle application process. In order to maintain the full look at all times, the lash extensions need refills nearly every 3 weeks. Adhesive-less and outgrown extensions are removed while new fresh ones are added on mature natural lashes. This procedure takes about an hour. Lash Lift Nutrition Intense is a brand new 3-in-1 method to intensify your natural lashes without any help from neither eyelash extensions nor mascara. If you are looking for a natural yet elegant, intense look that has length and curve, this treatment is for you. It is also strongly recommended while on break from lash extensions. All of our high quality products used in this treatment are developped in the European Union. The treatment is composed of 3 stages that take maximum 1h30. During that time you can enjoy yourself in a relaxing environment or even fall asleep. First a perming lotion is applied to curve the natural lashes. Then a deep black colour is applied to intensify the look and lastly a superbooster vitamin-enriched masque is applied so that your lashes can soak up all the beneficial active ingredients. Results last up to 6 weeks. That means 6 weeks without any mascara. We do not recommend this procedure for pregnant women. Micropigmentation is a technique that uses pigments auhtorized by the European standards and a sterilized needle to penetrate the superficial layer of the skin. (Similar to a tattoo but remains on the more superficial layers of the skin). It is the perfect solution for people who want their eyebrows to always look impeccably made up. It is also suitable for those who want to cover up holes and imperfections in their eyebrows and whose eyebrows don’t grow anymore. We offer two types of micropigmentation. Firstly there is the Filling method that gives an even result as if you had applied a pencil to fill in your eyebrows. Secondly there is the Hairstroke method where we recreate the shape and form of each idividual eyebrow hair. This is the most natural looking of the two methods and for a full set of eyebrows it takes about 1,5-2 hours. We start the appointment by listening to what the client is looking for in the results and our beautician will then share her professiona !l opinions and proposals. Firstly we disinfect the needle and all other equipment as well as the working zone. Then we clean the eyebrows and trace a line of eyebrows that matches the client’s morphology and face. Once approved by the client, we procede with penetration. We advise you to let your eyebrows grow out as much as possible before this procedure. Note that it is not recommended to pregnant women. In order to keep the results fresh and aesthetic we recommend a refill approximately once a year. Keep away from direct sunlight and pool, beach from one week to 10 days following the procedure Avoid long baths, showers and UV exposure on the tattooed zone Do not scrub the crust and skin particles Avoid peeling and scrubbing the tattooed zone Use a PH neutral soap or a gentle make up remover once a day on the tattooed zone Hydrate 3 times a day with a suitable moisturizer recommended by your beautician (for approximately 10 days) Do not donate blood during 3 months following the procedure In case of an MRI notify your doctor in advance. Requires only one refill per year. 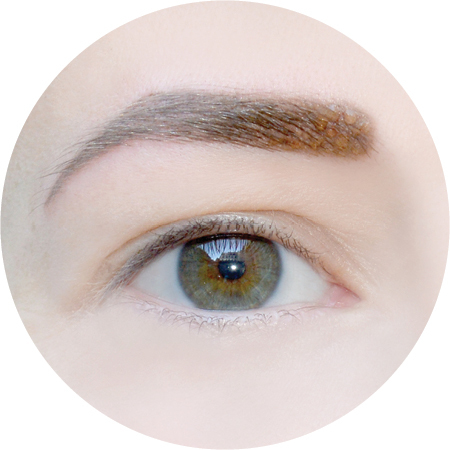 Ultimate Brow is a new fashionable eyebrow remodelling technique that consists of applying a special pigmented gel directly on your skin. 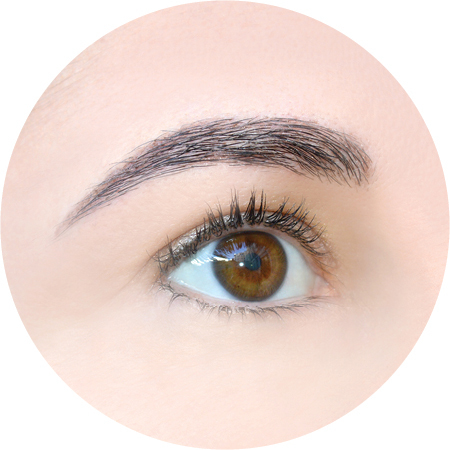 This method offers a large variety of options in terms of brow shapes and colors. The Ultimate Brow (UB) treatment takes about an hour, the result lasts for about two to three weeks. Cils de Marie beautician starts with a client consultation asking for her vision and giving her professional recommendations. Next step is shaping the eyebrows by tweezing, plucking and waxing. After that your beautician blends together a special mix of structural gel and color pigment, available in six different shades. The mix of pigments enables to create endless variations of brown and black and choose the perfect color tone for the particular client. Furthermore, the brows are peeled with a primer and the mixture is applied on the skin very thinly. The layer of gel can be felt on the skin for the first couple of days. After it softens and its texture is barely noticeable. Domestic care is very important. Ultimate Brow should not be rubbed and you should be careful while washing your face.